The atmosphere at the Nnamdi Azikiwe Stadium, which has since been re christened “The Cathedral”, was electrifying on the very last match day of this year’s NPFL season. All Rangers needed to be crowned league champions was a home draw. But the boys of Imama Amakapabo not wanting to leave anything to chance fired on all cylinders from the very first blast of the referee’s whistle in the game against Elkanemi. Some fans were still trooping into the jam packed arena when the Flying Antelopes took the lead in the 5th minute. Mexican waves, alien to Nigerian football to a large extent, took over as the fans enjoyed themselves. Scores stood at 3-0 with only two minutes to go. Organizers of the league, the LMC had already brought out the trophy even as the fans waited for the final whistle for the party to begin. With less than 10 minutes or so left of play, Rangers coach, Imama Amakapabo opted to make a late substitution which was only meant probably for the sub to have a feel of the action. The man Imama brought in was Ifeanyi Egwim, a player that had not been a regular all season. Egwim came in determined to make a quick impact, a move that ended up on a disastrous note as he copped a career threatening injury. The resultant penalty which was awarded Rangers was converted as final score line stood at 4-0, but Egwim’s injury spoilt the fun of the day as both Rangers players, officials and the fans shed tears, even as they rained abuses on the innocent El Kanemi goalkeeper who everybody initially thought was responsible for Egwim’s injury. The goalkeeper was red carded. However, video replays after the match on Supersports clearly showed that the Elkanemi keeper made no contact with Egwim in the one on one situation. Egwim only twisted his leg on the pitch. 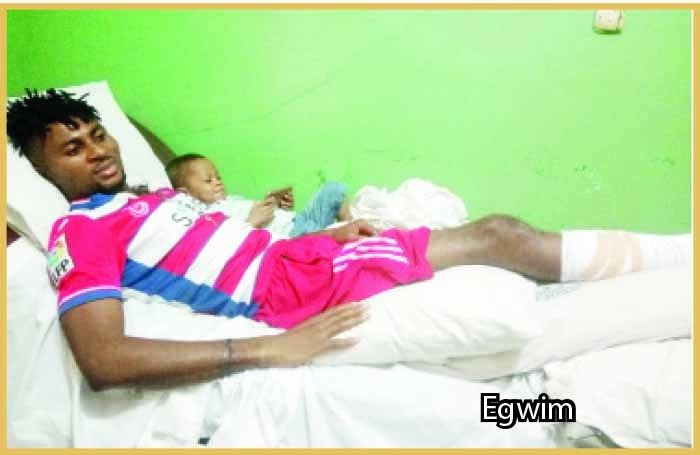 It is recalled that Egwim lasted only about five minutes on the field before being stretchered out and taken straight to the National Orthopaedic hospital, Enugu where doctors have declared that he would be sidelined for four months. The Enugu State governor, Ifeanyi Ugwuanyi who stole the show at the stadium as he led the support for Rangers had wanted to fly the player abroad, but doctors at the National Orthopaedic hospital insisted the injury was not beyond them to fix. Sunday Sunsports was told by medics at the hospital that Egwim has undergone a successful surgery and that the player would play again in four months. Egwim on his part told Sunday Sunsports that he is receiving the best of attention at the hospital but was quick to add that he would love to go Overseas for further check up when discharged. Egwim who was with his two year old son on his hospital bed when Sunday Sunsports visited, commended the Enugu State governor for visiting him and redeeming the N1m get well quick largesse promised him. He was quick in adding that his injury misfortune has nothing to do with the Elkanemi goalkeeper who was given the marching order by the referee. “Honestly, I m still confused. I find it difficult to explain what caused the injury. I can’t explain what happened to me. The goalkeeper made no contact with me, even though he rushed out for the ball when I was goal bound. I can’t blame him for this injury,” Egwim said. He stressed that his desire is to bounce back in good time to be part of Rangers’ CAF Champions League campaign next term. “I can’t wait to return to the pitch to be part of my club’s CAF Champions League campaign next year,” Egwim said. Will the club register Egwim for the money spinning continental competition now that he is down with injury? The club’s Media Officer, Forster Chime said that would depend on the coach. “It’s up to Imama to decide that. Imama knows how to use the players and how to get the best out of them,” Chime said. Experts believe Egwim is a victim of the dangerous nature of the artificial turf at the Nnamdi Azikiwe Stadium. They pointed out that this informs why the Enugu stadium as well as the ones in Kano, Bauchi, Port Harcourt and Benin can not host Super Eagles matches. “On television, they look good, but have you asked yourself why Eagles can’t play in Enugu, Port Harcourt, Bauchi or Kano? The big boys won’t agree to play there because they won’t want to cop a career threatening injury. Egwim got that injury because of the nature of the turf,” were the words of Ebi Egbe, the Chief Executive Officer of Monimichelle, a stadium construction outfit. Egbe said for the country to get things right, the rubber artificial turfs in Enugu and other stadia must be changed. “My company lay artificial turfs but they are not rubber artificial turfs that are always too hot and dangerous. Our turf is made of cocoa nut fiber and cork and it is a technology approved by world soccer governing body FIFA,” Egbe said. The LMC had after the Rangers, Elkanemi match also advised the Enugu State government to re grass the Enugu stadium pitch. Chairman of the league body, Shehu Dikko told Sunday Sports that they (LMC) did tell Gov Ugwuanyi that for Enugu to attract international matches, there is urgent need to re grass the stadium. “There is no doubt that what they have there right now is sub standard. We told the governor to do something about the pitch,” were Dikko’s words. Interestingly, it appears, the government is not in a hurry to do anything about the turf, even as Rangers prepare for next year’s CAF Champions League. The Enugu State sports commissioner, Charles Ndukwe told Sunday Sunsports that there is nothing wrong with the pitch. Club doctor, Emeka Onyi on his part, said the player is doing well and moving around. “For me there may not be need to fly him abroad now, but if the need arises, why not? It won’t be out of place to send him abroad for check up,” he said.